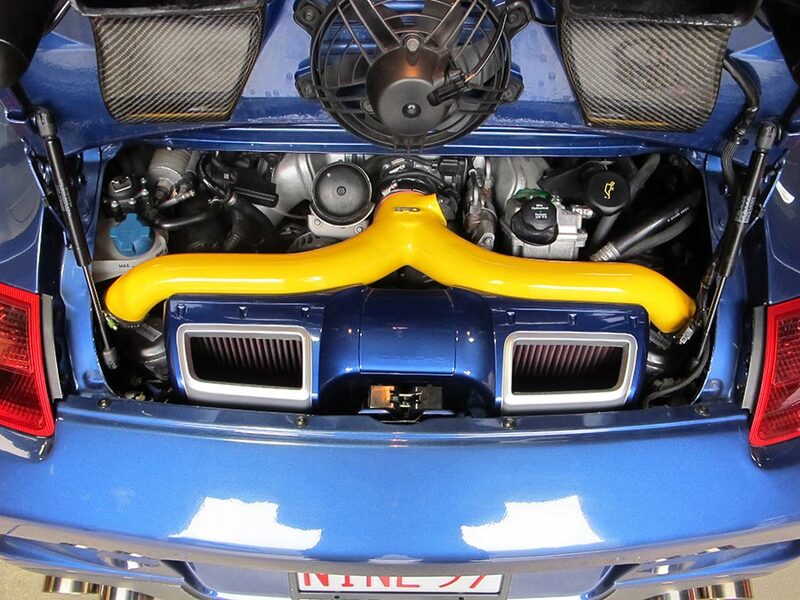 Shown above is the 997 Turbo Y-Pipe that has been polished and powder coated yellow to match the calipers and roll cage.Although the 991 Turbo Plenum is very similar to the previous 997.2 Turbo Plenum, the Y-Pipes are completely different from each other. IPD is currently performing all the R & D and will be engineering the best possible Y-Pipe that will feature many new IPD innovations. As with any Turbo application, bigger isn't always better and the goal is to always develop a Y-Pipe that delivers optimum flow and air velocity without being too large causing pressure drop, loss in boost response and ultimately performance. 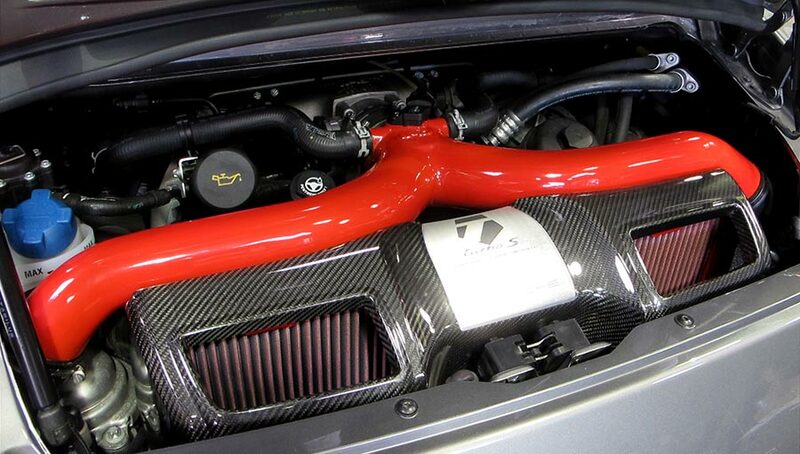 As you can see, Porsche designed a completely different Y-Pipe from the previous 997 generation Turbos. Let the R & D begin. Stay tuned for more details.The 991 Turbo IPD Y-Pipe will be designed to deliver more power and torque from the already potent 991 Porsche Turbo. This will not be a cast reproduction of the factory Y pipe but a complete re-design from scratch, developed to deliver even greater air flow for both stock AND highly modified Turbos. Shown above is the 997 Turbo Y-Pipe that has been polished and powder coated red to match the calipers.The factory Y-Pipe becomes restrictive when adding substantial power gains. This superior and more efficient design flows more cfm and reduces turbulent air flow as it enters the throttle body. The IPD Y-Pipes typical have larger inlets and an optimized diversion area that allows for impressive power gains. Of course the new 991 Turbo Y-Pipe will be a direct bolt in replacement that will not require any modifications or fabrication. We will post and upload all the latest news related to the development of the new 991 Turbo Y-Pipe as we continue the R & D process. Porsche's latest incarnation of the legendary Turbo continues to raise the proverbial bar of the sports car community once again. The latest 991 Turbo defies the laws of physics by delivering acceleration previously reserved for only the top tiers of the motorsport world. The level of engineering, design and technology invested into the new Porsche Turbo has created an automotive masterpiece that will take your breath away while driving behind the wheel or walking laps around the car while it's parked. 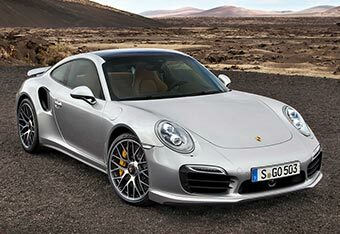 Porsche's continual and simultaneous quest for improved performance and enhanced efficiency is also taken to new heights with the latest Turbo. 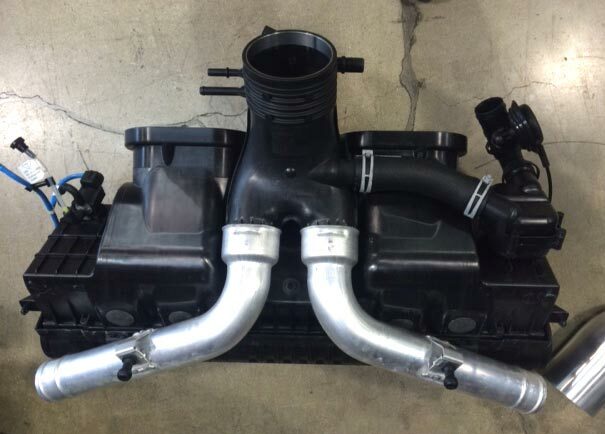 Porsche has employed their Expansion Intake Manifolds on the new 991 Turbo. According to Porsche these newly designed manifolds deliver "more power for less fuel". 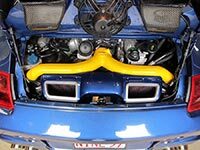 This manifold design is similar to the manifolds found on the 997 GT2. The good news is that the Air Intake Distributor remains a "T" style design and relatively unchanged from the 997.2 Turbo. This gave us a solid starting point with our R & D process here at IPD. We have our "test mule" 991 Turbo waiting patiently for the prototype Plenum that is currently under development. All of the IPD Plenums deliver great proven performance but they work exceptional well with turbo applications and the new 991 Turbo should continue this tradition. We don't have an official availability dates for the new 991 Turbo Plenum but we will be posting more details and a launch date on our Facebook page as soon as they are available. If you haven't already, make sure you "Like" our page on Facebook to stay informed of the latest IPD developments.